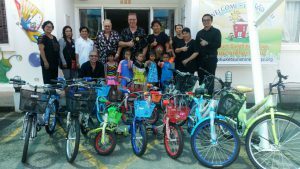 The Lions Club Of Phuket Andaman Sea at the Phuket Sunshine Village Foundation in Koh Sirae . We support the kids with 14 bicycles worth THB 18,000.- . It’s always a pleasure to see this smile on the kids faces when they get new toys….